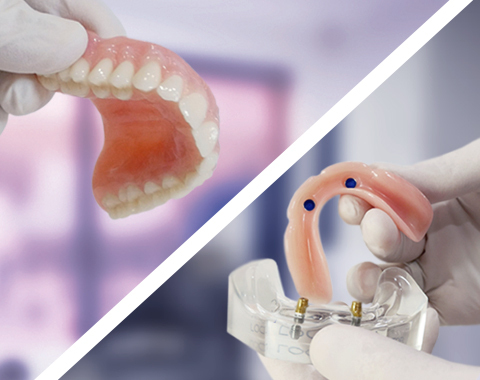 A comprehensive guide to options & associated costs for patients requiring replacement teeth. If you’re missing one tooth, several teeth or all teeth, there are usually several options available for you. And these options are determined by your dental and overall health, personal preferences and finance. In this guide, we’ve itemised the most common options available for patients who are missing teeth. However, this is just a guide. Before making any decisions, you must see a dentist. He or she can inspect your mouth, discuss your needs, objectives and options, then write a plan, including pricing and item numbers to present to your health insurance provider to find out exactly how much this procedure will cost. 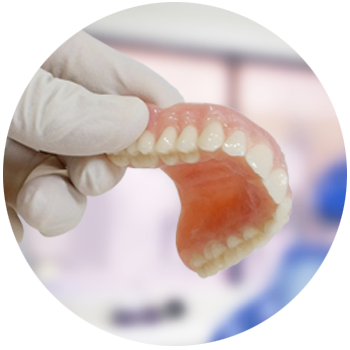 A conventional denture. No implants required. Stability/outcome: Will give the appearance of a permanent tooth. Makes biting and chewing easier. Not as stable as an implant-supported crown. Does not the provide bone density benefits an implant provides. Permanency: A permanent solution. Nonremovable. 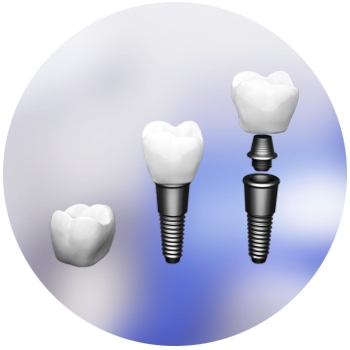 Stability/outcome: A crown is permanently secured, via an abutment, to a dental implant. The result is a tooth that looks and feels and is as stable as a healthy, natural tooth. Cost: From $4400 upwards. The cost increases for teeth at the front of the face, where generally, people desire a more natural looking result. Time: If your crown is at the back of the mouth, you may be given an immediate loading crown, done on the day. Crowds at the front of the mouth may take up to 3 months. Permanency: A fixed bridge is a permanent, non-removable solution. Stability/outcome: Gives the appearance of a natural tooth. Completely stable, behaving like a natural tooth. A good option for those with limited bone that consequently can’t have implants. However, the two neighbouring teeth need to work as anchors, so must be in healthy bone and have to be shaped to support the bridge. Stability/outcome: Will give the appearance of a permanent tooth. 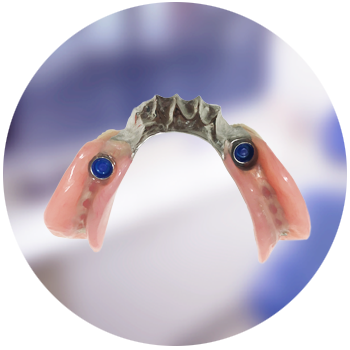 Makes biting and chewing easier, but is not as stable or comfortable as an implant-supported denture. Needs to hook onto remaining natural teeth with clasps for retetion. However, it’s a cost-effective option for those not able or choosing not to have implants. 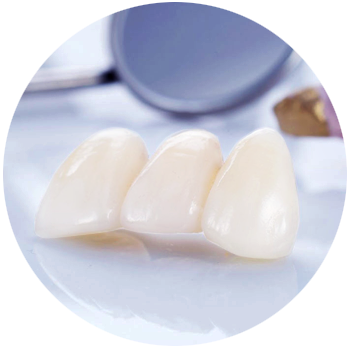 Stability/outcome: An excellent solution providing great stability comparable to normal teeth. 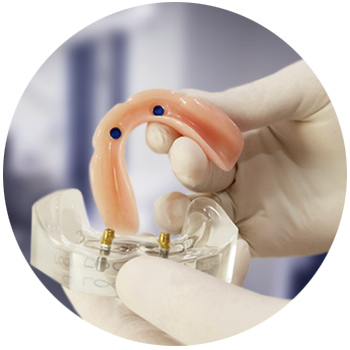 Also, the implant stimulates bone to maintain bone activity, so there is less bone loss and facial collapse. Easier access for maintaining healthy implants. Stability/outcome: Gives the appearance of a natural tooth. Completely stable, behaving like a natural tooth. A good option for those with healthy remaining natural teeth if you are still pleased with their aesthetics but have a few large gaps to fill and don’t want a removable solution such as a partial denture. 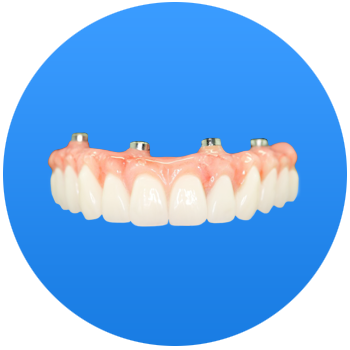 Implants are placed in the open areas and a 3 or 4 unit bridge is secured to abutments, screwed to implants that resemble the remaining natural teeth. Stability/outcome: Will give the appearance of a permanent tooth. Makes biting and chewing easier; however, hard, chewy foods can be difficult to chew. Does not provide the bone-stimulating benefit of an implant. However, it is a cost-effective option for those not electing to have implants. Cost: Approximately $1250 upwards for a full set. Cost may go up to $6000 for a full upper and lower set depending on quality preferred. Stability/outcome: An excellent solution providing great stability comparable to normal teeth. Also, the implant stimulates bone. 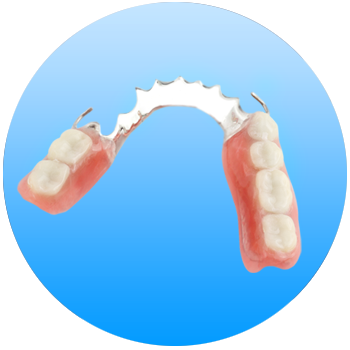 Minimal movement of the denture, allowing a greater biting force and fewer sore spots than with conventional dentures. Also, less bone loss and facial collapse. Stability/outcome: Provides the closest semblance to stable, natural teeth. Looks, feels & functions like normal teeth. Jawbone benefits from the dental implants, helping preserve bone density in the long-term. Cost: The most expensive option. Priced from approximately $16k upwards. Why bother to replace missing teeth? Most people find that missing one tooth or several teeth is a concern for both their appearance and health, e.g. ability to bite and chew food. For some, however, having a couple of missing teeth may not be such a concern. If this sounds like you, we still recommend you discuss your choice with your dentist. When your teeth are missing, your neighbouring teeth no longer have support to keep these existing teeth in place. Therefore, over time, your teeth lose alignment, moving into the area of the missing teeth. If you are missing all or several teeth, your jaw bone no longer receives the simulation from your tooth root every time you bite and chew to keep the jawbone strong. Consequently, the bone starts to resorb, and your jawbone starts to disintegrate, making your facial features fall in. Dental implants help prevent bone resorption occurring. 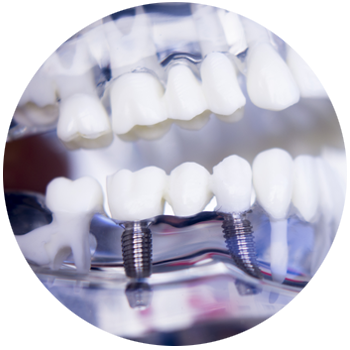 Want to learn more about our dental implant and denture options? Contact your local clinic for more information. Dental finance available with Pretty Penny Finance. Still unsure? Book a consultation now!